What people are saying about Luke's Recordings. "A very good UK album, produced by Dave Hayward, which I enjoyed and will be popular with the fans." Sue McCarthy - Southern Country magazine. "Best cut on the Hotdisc." "Great Voice he has, I love it." "A breath of fresh air to the British Country scene"
"A real five star album from an artist who is a real star"
British Country singer / songwriter, Luke Guy Reed has acheived a great amount with his aclaimed, largely self penned, album NO HAT. Glowing reviews in all the UK Country mags, solid support from DJ's across the UK, Europe and increasingly the world, interviews on radio, TV and press. Luke was born and brought up on the Isle of Wight, a small island off the south coast of England. Like most youngsters, Luke took a keen interest in the music of the day, and as a teenager listened to The Beatles, Stones and later his favourite band The Eagles. However Luke was unusually interested in country music at a very early age and listened to and played the songs of Hank Williams, Hank Snow, Earl Scruggs and Lester Flatts, Carter Family, Johnny Cash, Elvis, Buddy Holly, and The Everly brothers and later artistes such as Waylon Jennings, Kriss Krisstoferson, Buck Owens and Merle Haggard. He was getting noticed on the music scene and it was not long before local musicians from Brian Munro's "Union Pacific", approached Luke to front the band while Brian took a break due to illness. Luke remembers well his first songs with the band; You Win Again and Ring of Fire. After several months Brian was able to return, and at this point Luke formed his own outfit, going out as "The Renegades", with Keith Shilcock and John Mansell. He later worked with a variety of musicians to make up the band including Carl Bowman from "Mathews Southern Comfort", Pick Withers From "Dire Straits" and members of Charlie Dore's "Back Pocket Band", including Keith Nelson a multi talented session player who instigated Luke's song writing. In the late seventies a severe accident took Luke away from the British country music scene. In the late eighties he decided to go to North America to pursue his interest and connections in the Native American culture, travelling extensively throughout the USA and Canada. In the mid nineties Luke decided to settle back on the Isle of Wight and resume his musical career. He met up again with Keith Shilcock from the Renegades, and they started playing as a duo. Luke also started work recording some of his self penned songs at the Music Pool studios with Volker Katt on the Isle of Wight. During this period, Luke met Dave Hayward of D.H.Studio, who at the time was playing with "Marietta Station" as a session pedal steel player. Dave did some additional work on the original recordings and Luke's first five track CD "If It Feels Good " was released. Luke and Dave continued to work together and recorded the live backing tracks that Luke uses in his solo act. Luke's exposure was boosted after appearances at "Brean Sands" and "The Luton Country Music Festival" and the bookings in clubs, festivals, and theatre's thoughout the UK increased rapidly for this very popular solo artist, including excellent interview and air play coverage on radio. Since those early day's "Luke" has maintained his popularity throughout the UK and it has now spread to Europe , Australia and North America. The No Hat Album was originally released across the UK/Ireland on Solent Records on June 16th 2003 with full national distribution by NOVA / Pinnacle, making it available through all independent and chain store outlets for a year. Solent Records/Songs is looking for cover opportunites for these songs, sub-publishing in other territories, licensing outlets for the recordings worldwide and top class booking agents to develop his full potential. The songs are published and promoted by Solent Songs and the tracks can be licensed from Solent Records. As of early 2015 Luke is still available for gigs anywhere in the country, as a solo or with a backing band, according to your budget. He is also putting the finishing touches to a new album which comprises Waylon Jennings covers and half a dozen new songs from Luke himself! 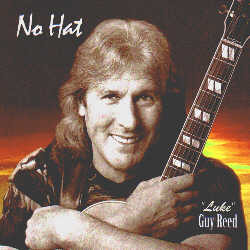 Please contact Luke direct for news, bookings or copies of the No Hat or new album. If you run a Record label, Publisher, Management, Agency or Radio station and would like a full CD of Luke's material e-mail Solent Records NOW!